Many people don’t realize it, but your oral health can tell dentists a lot about your overall physical health. Over 120 diseases show symptoms in the mouth, ranging from inflamed, swollen gums to bone loss. For these reasons, it is vital to attend your normally scheduled dental checkups. Because bacteria can cause inflammation and infection that can spread throughout your body, all kinds of serious systemic diseases are tied to poor oral health, including osteoporosis, diabetes, heart disease, respiratory illnesses, and even cancer. In fact, research has shown that adult men with gum disease were 54% more likely to develop pancreatic cancer and 30% more likely to develop blood cancers, such as leukemia. Research has also shown that the same strains of bacteria present in your mouth can be found in the plaque lining your arteries, leading scientists to believe that the inflammatory response due to gum disease has larger impacts than most people suspect. Additionally, since your smile can affect your self-confidence, having poor oral health can also affect your ability to interact with others without feeling self-conscious. Over time, a complex about your smile can make it hard to work in social settings or date, which can affect your emotional health. Many patients report feeling happier and more confident after undergoing restorative or cosmetic dentistry procedures. Early attention to the mouth-body connection could help you to fend off issues before they occur. "Your teeth are interconnected with the rest of your body, so that conditions that affect one will frequently affect the other." ● Eat A Healthy, Varied Diet:Focus on giving your body the nutrition that it needs to fight off illnesses. Eat a variety of fruits, vegetables, grains, and lean proteins. Focus on mixing up your meals and adding lots of color to your plate. Crunchy vegetables, such as carrots and celery, give your teeth a natural cleaning, since they have a fibrous texture. ● Exercise Daily:Exercise does more than trim your waistline. In addition to helping your body to rid itself of cellular toxins, moving around also improves blood flow, which can keep your teeth healthy and strong. ● Hydrate, Hydrate, Hydrate:Drink water to help your teeth and to hydrate your body. Much of your body is made up of water, and without it, you could experience a myriad of other health problems. Drinking water also helps to wash away food particles and bacteria, naturally cleaning your teeth. ● Focus On Proper Dental Hygiene:Pay attention to daily brushing, flossing, and rinsing. Don’t feel silly if you need a refresher course from Dr. Newman. Preventive care and education are crucial to keeping your teeth healthy and clean. Patients should be brushing twice a day with a soft-bristled toothbrush, flossing daily, and rinsing carefully afterwards. ● Attend Regular Dental Checkups:Lastly, never skip your dental checkups. Talk with Dr. Newman about the checkup frequency that is right for you. 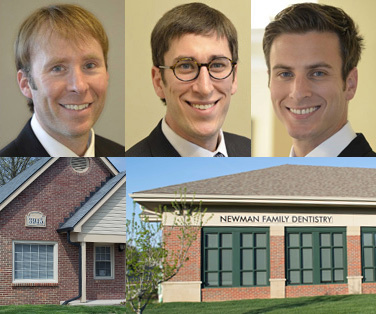 Newman Family Dentistry is currently accepting new patients. To schedule your next checkup today, click this linkto use the convenient online form. If you are a new patient, click herefor our online new patient forms. We look forward to meeting you and your family, and helping you to achieve the smile you’ve always dreamed about.